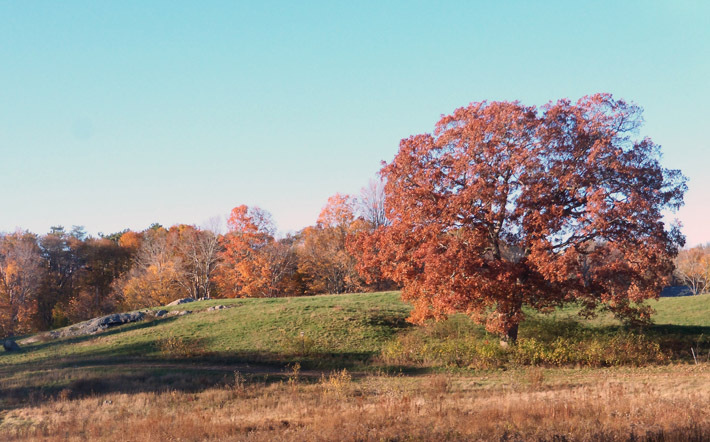 Owned by the Trustees of Reservations, Appleton Farms is America’s oldest working farm, with rolling grasslands, grazing livestock, stone walls, extensive forests, and historic farm buildings are part of the farms 1,000-acre pastoral landscape. The farm operates a 550-member Community Supported Agriculture program, and a farm store that sells the artisanal cheeses, butter and yogurt as well as beef and eggs. Appleton Farms along with the neighboring Appleton Farms Grass rides offer more than 12 miles of walking trails, a visitor center, and is open to the public seven days a week. Featured above is the Appleton Farms “Old House” which is now the visitor center. Many generations of the Appleton family lived in the “Old House” at Appleton Farms. Samuel Appleton was an original settler, and his brother Isaac built the first section of the Old House in 1688. Samuel Appleton of the fifth generation of the family greatly expanded it in 1784 with Georgian/early Federal features, and later generations added Victorian flourishes to the farmhouse. Successive generations of the Appleton family gutted and rehabilitated the house at least six times. Read the Appleton Family history. Appleton Farms is one of the oldest continuously operating farms in the country, gifted to the Trustees of Reservations by Francis and Joan Appleton. 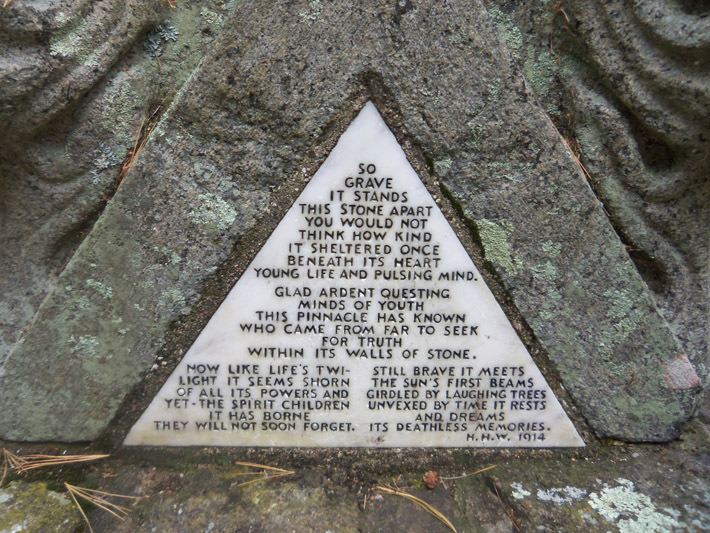 It was originally granted to Ipswich settler Samuel Appleton. The farm continued in family ownership for seven generations. 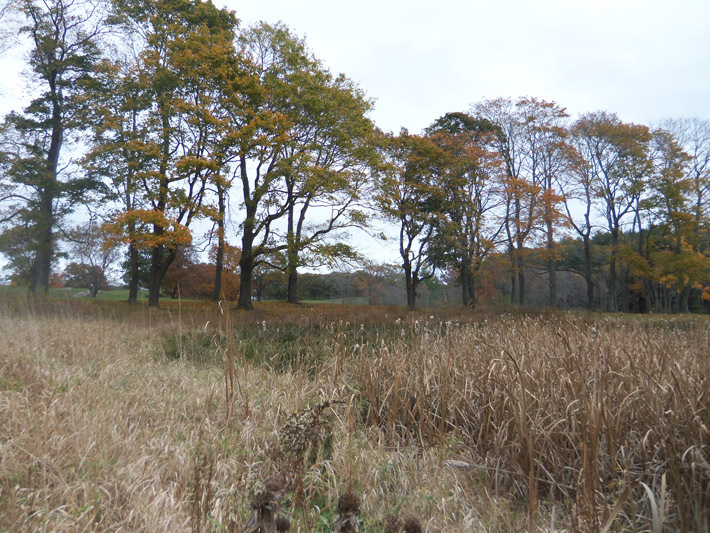 The property consists of forests, fields, wetlands and small glacial hills. 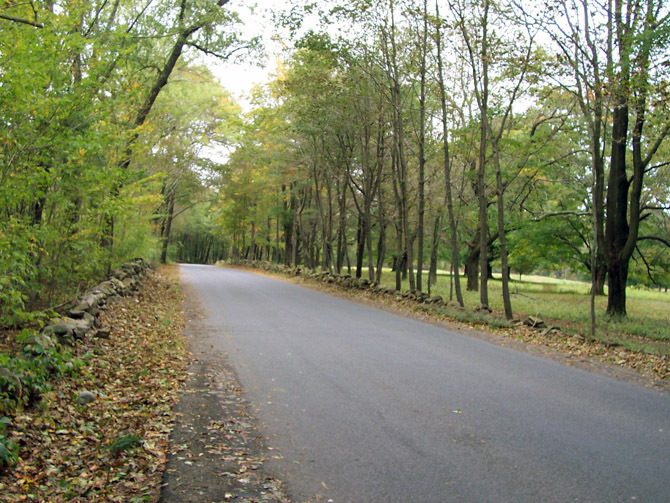 The Hamilton section is known as Appleton Farms Grass Rides on Highland St. View directions. Major Samuel Appleton’s house, which stood on the opposite side of Waldingfield Rd. The Waldingfield mansion was constructed, attached to this house, and both burned in 1916. 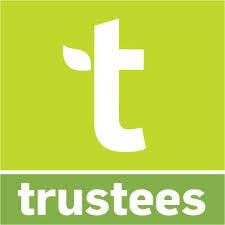 The Trustees of Reservations assumed responsibility for the farm in 1998, and renovated the 200-year-old house with green technology, restoring it to its Georgian essence. The home had fallen into great disrepair, but the core of the home has been saved. The renovation preserved hand-hewn timbers, heart-pine floorboards, Victorian-era windows, decorative moldings and mementos. The newly opened visitor center includes furniture, portraits, photo albums, books, and other objects original to the house. The house tells the story of one family’s history from settlers to farmers to “gentleman farmers” over the course of 371 years. The Appleton Farms “New House” was built in 1891, demolished in 1961. “Waldingfield” on the opposite side of Waldingfield Rd. was built in 1893, but burned, along with the original Samuel Appleton house, which was attached to the rear. The Waldingfield house was replaced by a new house built of solid masonry, still standing. The intersection of Waldingfield Road and County Road (Bay Road) marked an area with tremendous wealth, with the Appleton estate Waldingfield on the west and the Proctor estate on the east. 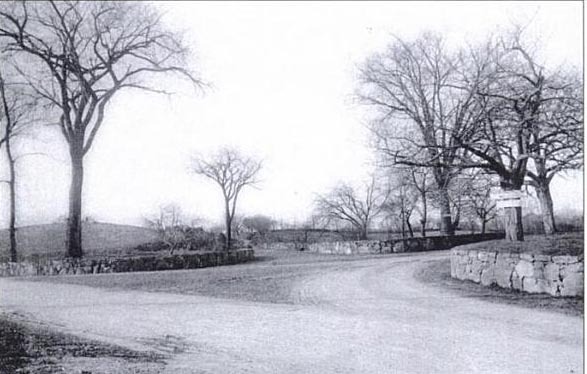 Continuing west on the north side of Waldingfied Road, The Captain Isaac Smith house was purchased by Helen, wife of Randolph M. Appleton, son of Mr. D. F. Appleton, who apparently gave it the name “Applefield.” There were two Tuckerman-Appleton marriages, and the Tuckerman family owned several elegant properties between Waldingfield Rd. 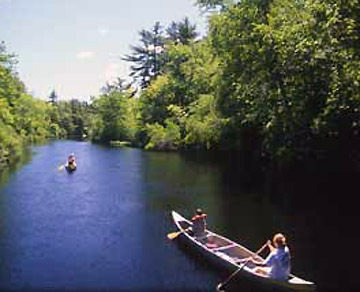 and the Ipswich River. “Applegate,” was owned by Charles Tuckerman and his wife Ruth Appleton. “Waldingfield” was built by Randolph Morgan Appleton. “Sunswick”, bordering “Waldingfield” on the west, was built by Bayard and Annie Tuckerman. Even today Waldingfield Road with its beautiful stone walls, tree-lined pastures and grand homes is one of the most scenic ways in Ipswich. Reaching Highland Street, the Appleton holdings extended on either side of Mill Road to Topsfield Road, bordering the Rice properties. The Rev. W. G. Thayer constructed his summer residence not far from the bridge, along the river, and named it Holiday Hill. 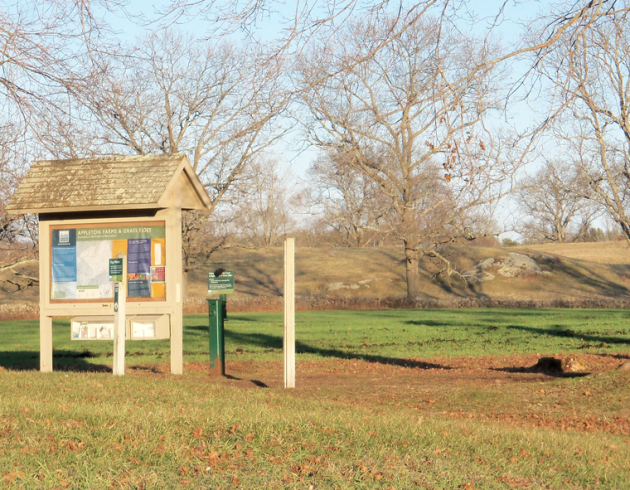 The most easterly section is forested with several miles of carriage trails and is known as Appleton Farms Grass Rides, originally designed for horseback riding. 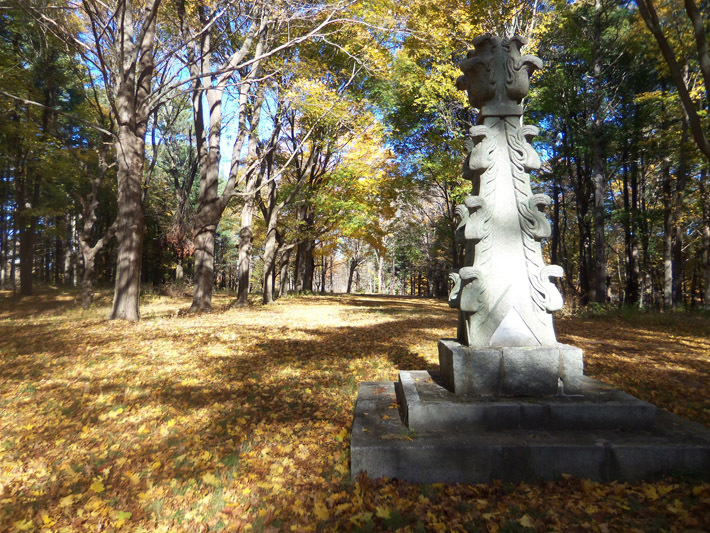 There are four granite pinnacles salvaged from the former Harvard College Library standing as silent sentries in the two sections . 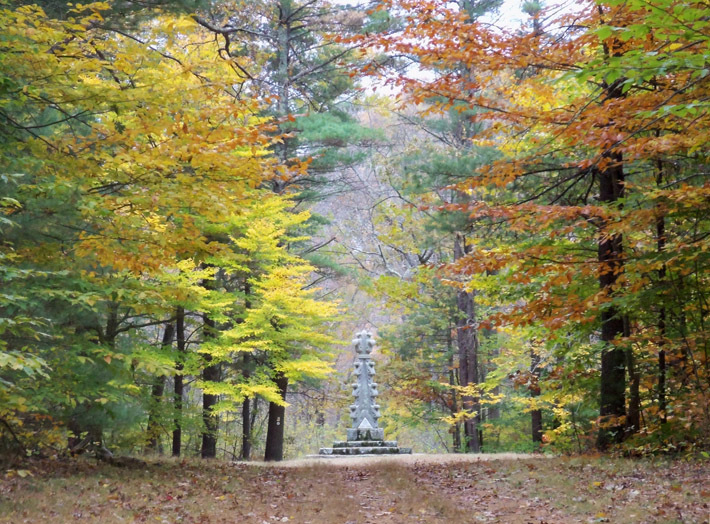 Read more about the Appleton Farms pinnacles. 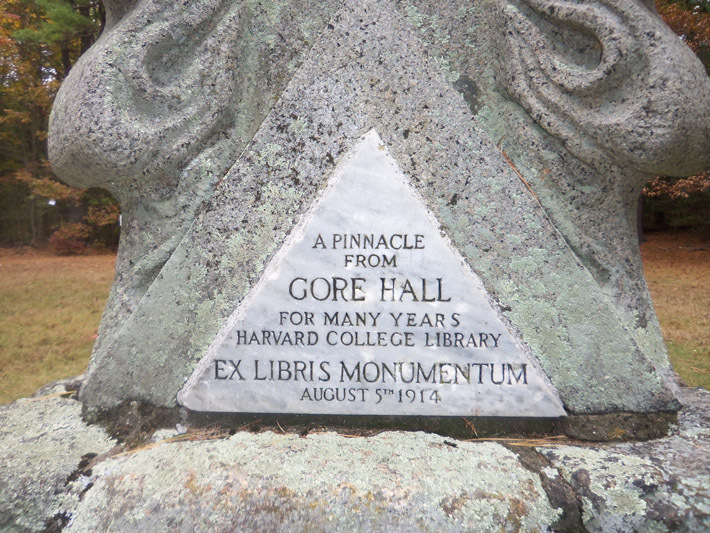 A pinnace from Harvard’s Gore Hall was erected between the “New House” (no longer standing) and the commuter rail tracks. It is dedicated to Francis R. Appleton Sr. 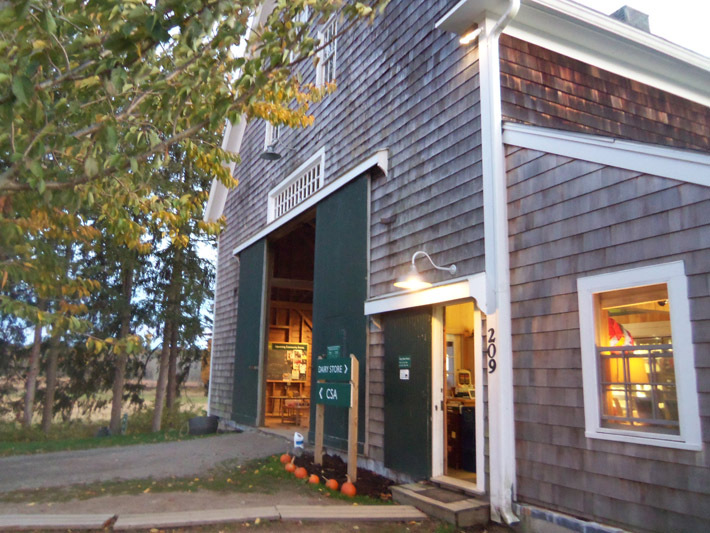 In the summer, the Appleton Farms CSA and Dairy Farm Store is a good turnaround spot, with some snacks and drinks available. 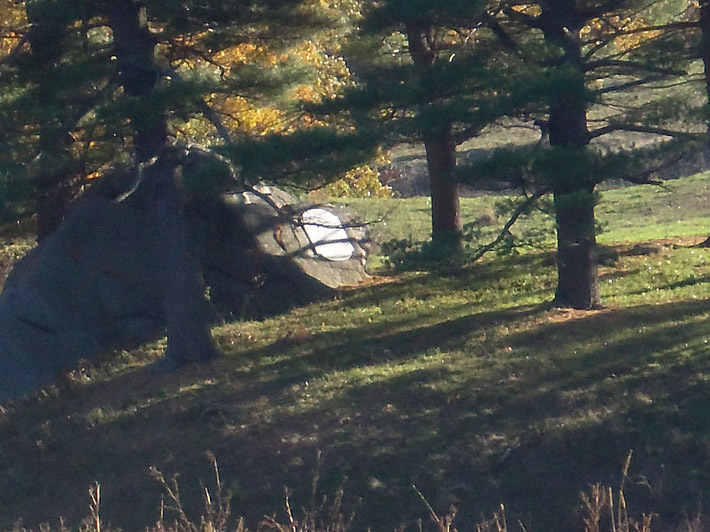 A rocky ledge offers views of the Great Pasture and the landscape beyond it. 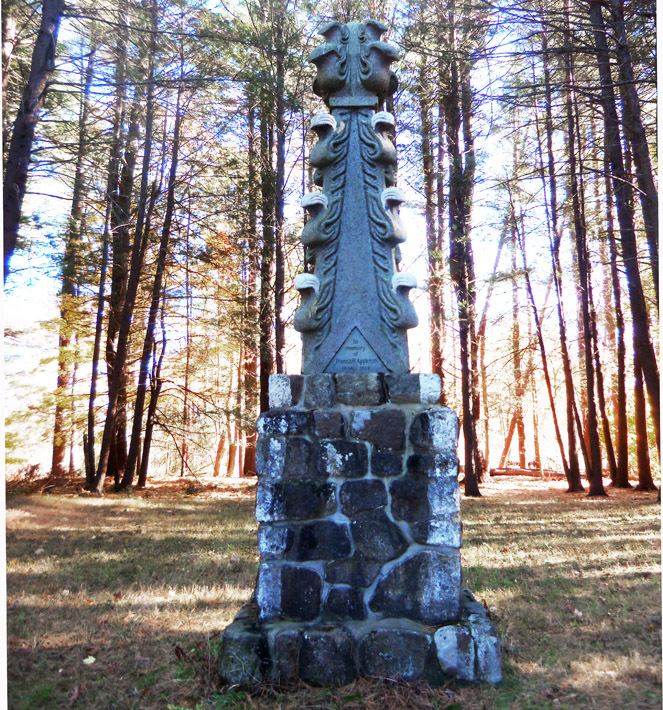 The pinnacle at Pigeon Hill is dedicated to Col. Francis Randall Appleton Jr., the ninth and final generation of the Appleton Family to farm this land. Thanks to the foresight and generosity of the Colonel and his wife Joan, Appleton Farms is owned and protected by the Trustees of Reservations. Five carriage paths meet at the “Roundpoint,” with a large granite pinnacle commemorating Harvard’s Gore Hall in the center. Five carriage paths meet at the “Roundpoint,” with a large granite pinnacle commemorating Harvard’s Gore Hall in the center. The two paths shown here lead toward the Grass Rides entrance on Highland Ave. One path ends at Cutler Rd., another crosses the commuter rail tracks, and the fifth is the path I took from the center of the Grass Rides. 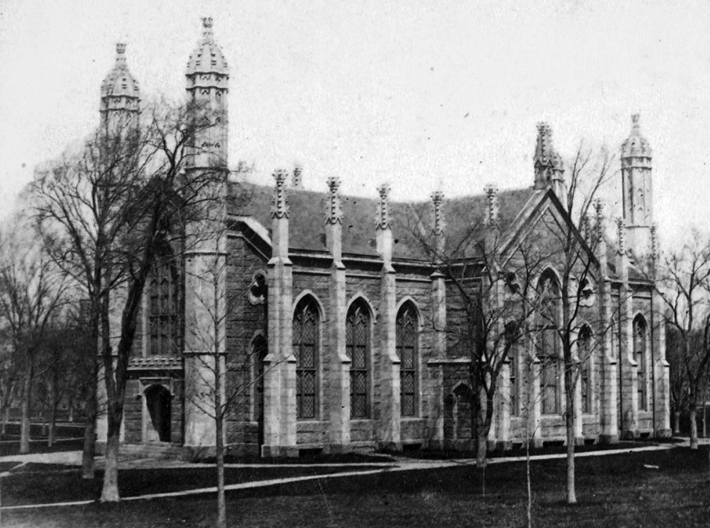 Gore Hall, the former Harvard library, was demolished in 1913. The carriage trail from Roundpoint to Cutler Road leads to a footpath that crosses a stream and this esker. Shown on the map are several cross-country ski outings, each about 4-5 miles, and taking up to two hours. 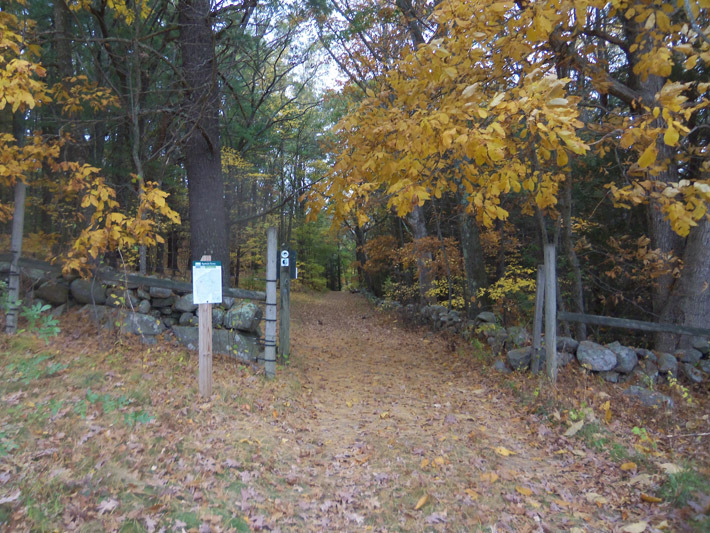 The blue track above at Appleton farms follows trails around the perimeter of Grass Rides, and is exactly 4 miles. There are several miles of intersecting trails in the Grass Rides section that are not shown on this map. The orange track is 4.6 miles, and also starts at the Grass Rides parking lot on Highland Ave. It goes to the other side of the tracks through the Appleton Farms Property, then returns. An additional couple of miles is possible through the fields along Waldingfield Rd. The blue track at Bradley Palmer State Park followed the perimeter but I followed a trail that took me to Highland St. and went off the Park land for a short distance. 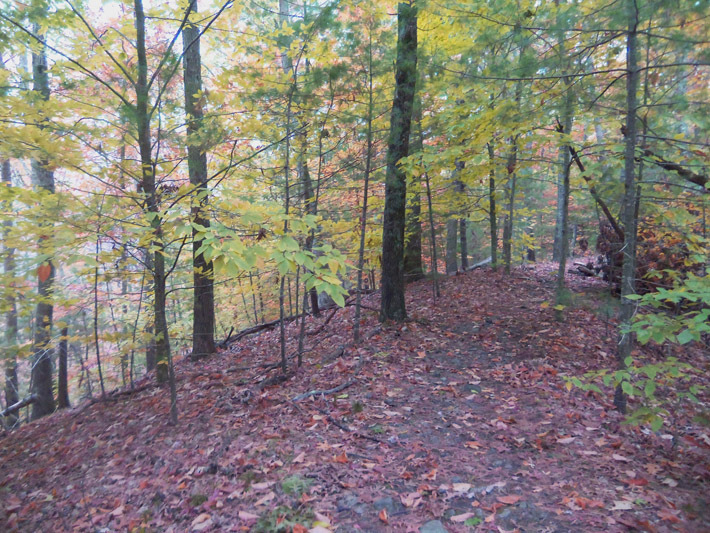 The orange route at Bradley Palmer includes some easy climbs and lots of meadows. *note: these colors are for this map only. The two parks have their own trail numbering and marking systems. The yellow route is the Pingree Reservation. You can use these trails to connect Appleton Farms with Bradley Palmer State Park. 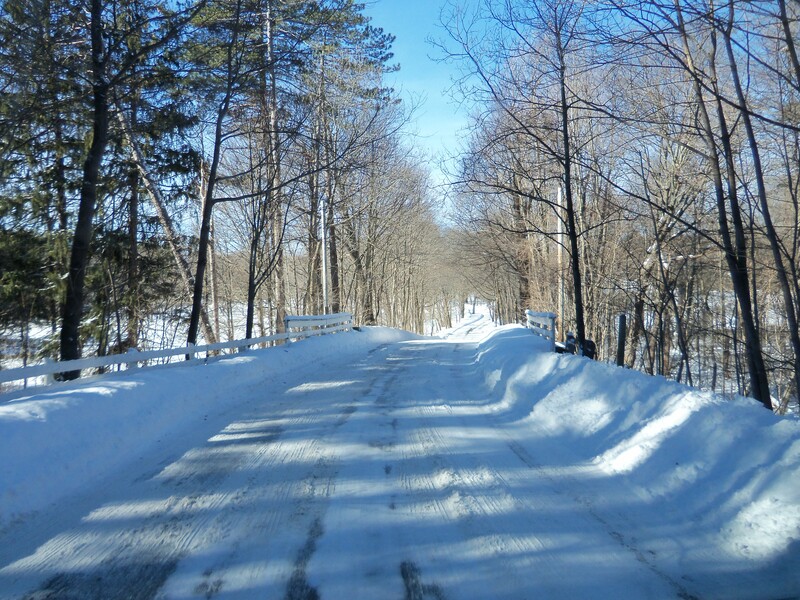 The red route is a 3 mile trip on old roads in Willowdale State Forest. The lime colored path used the pedestrian bridge over the Ipswich River and visited both parks. February 2017: One of several trails that intersect at the monument in the background. February 2017: A wooded ridge separates the Great Pasture from Appleton Farms Grass Rides. 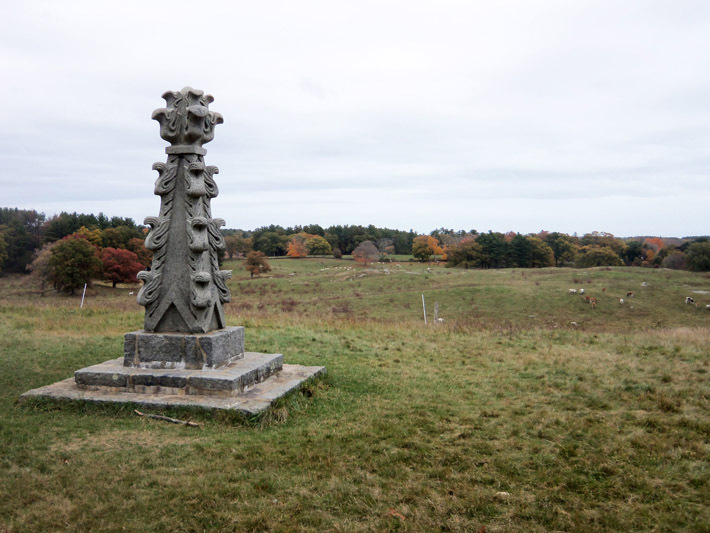 One of three obelisks at Appleton Farms that once sat atop Gore Hall at Harvard. The view from this knoll looks out on the Great Pasture. 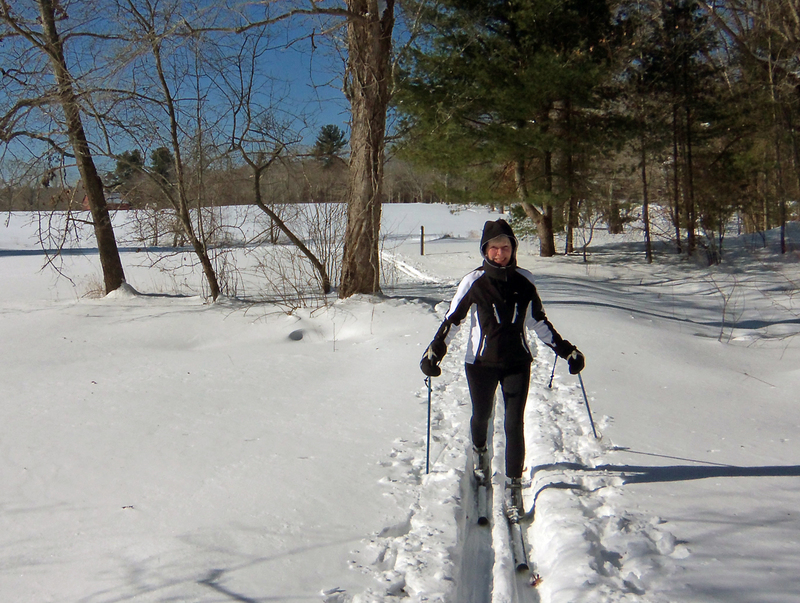 The North Shore Nordic Association promotes winter use of our area’s existing trail networks and recreational assets by partnering with existing organizations and governmental entities to plan and maintain a system of winter trails for human-powered snow sports such as cross-country skiing, skate skiing, and snowshoeing. 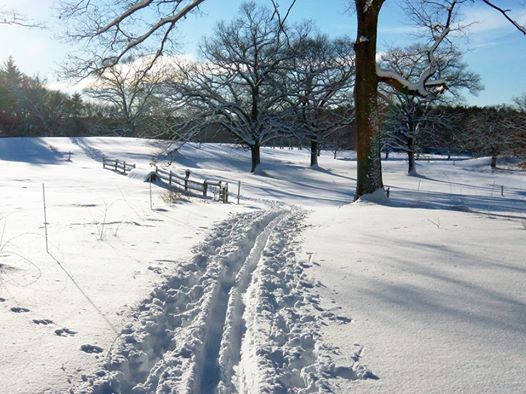 By providing a network of groomed trails, trail maps and signs, NSNA encourages and facilitates active living and exploration of the outdoors in winter. Use of the groomed trails is donation supported and open to all.